Doors at 6:30 p.m. | Readings at 7:00 p.m.
Swipe right on an evening of intriguing and unique BC books and stories. 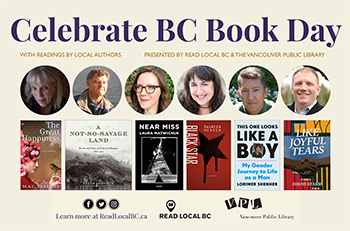 Celebrate the sixth annual BC Book Day on April 30 at a gathering of local authors, presented by Read Local BC in partnership with the Vancouver Public Library. FREE TO ATTEND — Please RSVP here! Carl Peters will be presenting two papers at the American Literature Conference: “I Wanted to Teach a Poem: Reading William Carlos Williams” and “Clinical Modernism: Physician and Poet: William Carlos Williams.” More information here. Cottagers and Indians takes a sincere and pragmatic look at the current conflicts between First Nations traditional water usage and property owners in cottage country who are looking to enjoy an undisturbed summer getaway. Written by Drew Hayden Taylor, an award-winning playwright, journalist, novelist and filmmaker, Cottagers and Indians had a successful debut at Tarragon Theatre in 2017. More info here.